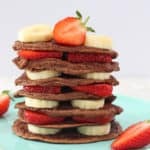 Delicious Chocolate Pancakes made with just 3 simple ingredients – bananas, eggs and cocoa powder – perfect for baby led weaning and toddlers too! Put the bananas, eggs and cocoa powder into a blender and blitz until smooth. Heat a little oil or butter in a large frying pan and pour in the batter. The mixture should make 8 small pancakes and cook in batches if needed. Fry for about 2 minutes on either side until browned and cooked through. 1. These pancakes can also be made ahead of time and kept in the fridge in an airtight container for up to 48 hours. To reheat, fry them gently again in a frying pan or warm in the microwave. 2. They can also be frozen. Stack them with a layer of parchment paper between them so they don’t stick. Leave out for a few hours to defrost and then reheat as above.